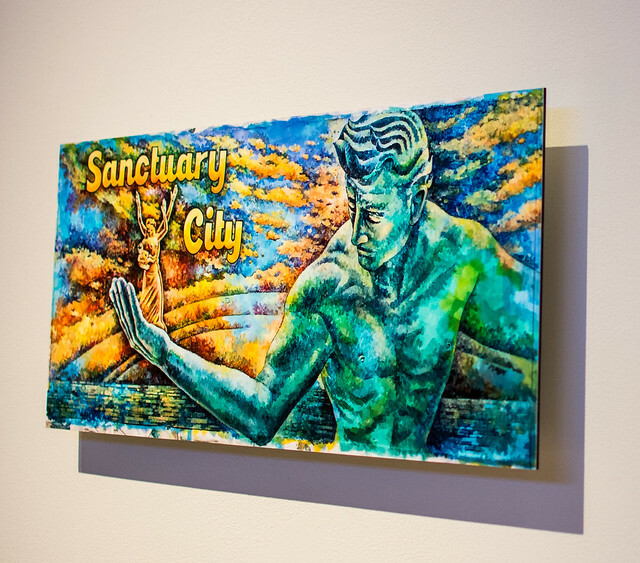 UNIVERSITY CENTER — The Marshall M. Fredericks Sculpture Museum at Saginaw Valley State University is hosting the exhibit “Motor City Icon: The Spirit of Detroit” from Oct. 5 to Jan. 19. The exhibit features artwork from various artists in celebration of the 60th anniversary of the era-defining sculpture. Inside the museum, the display is divided into four sections: historical documents and photographs, objects shown next to the “The Spirit of Detroit” (and, of course, “The Spirit of Detroit” itself), an area with a short-animated film and contemporary artwork. So inspiring was the quote that Fraga also based his work off of it. His piece features veils over the photographs of people. Fraga did this to represent the part of the quote pertaining to the veil over the face. “I used part of his [Marshall Fredericks’] [work] […] to draw [inspiration] from; [to learn]what his intention was, […] [to] honor what he did and [to] honor the spirits of the people that came beforehand,” says Fraga. For artist Susan Goethel Campbell, “The Spirit of Detroit” is more than a sculpture, and is a symbol of community and support. “‘The Spirit of Detroit’ to me is a lot about community and how artists support one another,” informs Campbell. Campbell’s sentiment was echoed by other artists, such as Jeanne Bieri, whose piece displays an army blanket piece from World War II, in addition to buttons and other objects found in the streets of Detroit. Detroit is a city full of hope and culture, which is showing itself in the artists that live there. Saginaw is not Detroit; but, you can get a sense of Detroit’s community and spirit up until Jan. 9 when “The Spirit of Detroit” leaves the SVSU campus.